Sign on at the Phoenix Park – Wellington Memorial. 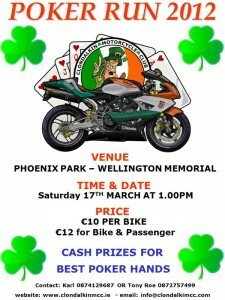 €10 per bike or €12 for bike & passenger with cash prizes for best poker hands. See http://www.clondalkinmcc.ie/ for more info.